In spite of the bizarro way it was presented in the film, I actually like the Freakin' on the Freeway song- although it is a bit repetitious, and the version heard in the film seems to have been produced for a grand total of about $10.00. 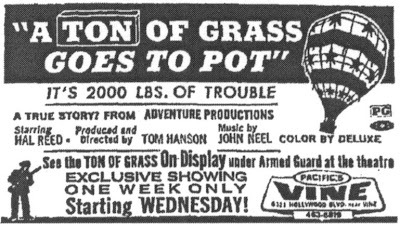 Here's hoping that A Ton of Grass Goes to Pot turns up some day- I'd like to see all those scenes with the actors who are mentioned in the end credits, but never appear in The Big Score. Incredible to learn that Big Score had been edited on VHS ! For the story, Big Score was also screened 3 days (from wednesday to sunday) in 1973 at an Indianapolis Drive-In called Bel-Air in double feature with The Brutes. 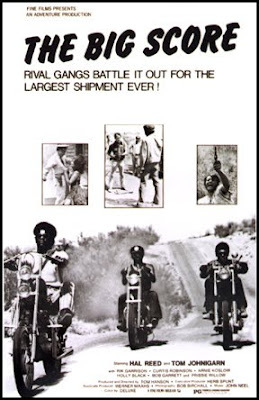 Long time ago I have found an uncomplete presskit and some drive-in advertisements of that film that really made me think it was a lost Blax biker movie. So now I can see it seems to be more beatnik than blax' but it looks great anyway ! Thanks for all that informations ! I grew up with Tom Hansen's son Jim. We were both students at LeConte Junior High during the time of the filming and films relaese. I'll never forget the afternoon when we were working this gig distributing coupons for "Jim's Discount Tires" on Sanata Monica, just west of Van Ness. There we were, on the day of the preimier when Jim Hansen pointed at this stake bed truck filled with fake kilos of weed guarded by fake Nazis and said: "That's my dad's movie." I thought he was bullshitting me until later when he showed me one the promo posters. Tom Hansen was a trippy guy. He founded Pizza Man and coined the phrase "We Deliver" his sillouhette still appears wherever that logo is scene. I later worked for Mr. Hansen when I was attending Hollywood High in the early seventies at his resturant called "The Wild West" in Van Nuys. Talk about weird scenes inside the gold mine. Glad you guys posted this obscure piece of cinematic trivia.